If you walk from Zambia to Zimbabwe, as I did a couple of days ago, you cross over a metal suspension bridge perched 111 metres above the Zambezi river gorge. 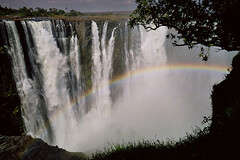 From your right comes the constant thunder of Victoria Falls. To your left, a bungee-jumping booth stands on the left side of the bridge. If you look over the edge, you may see, far below, amid whitewater wrinkles, yellow Tonka-toy-sized river rafts, full of adrenalinized tourists about to brave 22 of the 24 rapids of the lower Zambezi gorge. African gas stations also include stores, which sell sweets, snacks, drinks - and, often, luxury imported goods. Mobil Marts, BP Shops, and La Boutique at Total (they're not being pretentious, it's a French company) are sometimes where you go for European cheese, chocolate, and toiletries, because they're built with gleaming international-standard production values, they feature backup generators that keep fridges running during power cuts, and they are already tied into reliable international distribution networks. If you walk into La Boutique at the Victoria Falls Total, you will see a large Coca-Cola fridge with a crack across one pane. Large and utterly empty. There is Fanta, curiously; there are local Zimbabwean fruit juices; but when I entered Zimbabwe, there was no Coca-Cola available anywhere in Victoria Falls. This was somehow more shocking than the absence of gasoline. Sometimes the first impression says it all. There is no fuel here because there is no money. No foreign money, that is; no hard currency. The country is awash in Zim dollars, millions and billions of them, thanks to the governmental inability to realize that printing more money is not a valid solution to an economic crisis. When I was here seven years ago, US$1 bought you Z$20. Today's black-market exchange rate is US$1=Z$100,000. I changed $20 at a bank here (it's wise to have an Official Exchange Receipt handy) and the very thorough clerk gave me small change, including a Z$20 note, which has a value of 1/50th of one US cent - literally not worth the paper it's printed on. On the other end of the scale, the largest note is Z$20,000, worth less than a quarter. Change a hundred dollars, and you get a wad of notes - cheap notes, printed only on one side - four inches thick. Every retail transaction is slow here because both sides have to take an appreciable amount of time just to count the money. (Which leads to yet another money-changing danger, the undercount. So how do you change money on the black market? It's actually not an issue that comes up often. In all my travels, I've only found real currency black markets in Nigeria and Zimbabwe. Artificial, unsustainable currency rates are such an obviously bad idea that they only happen in semi-failed states. (Fully failed states like the Congo just use US dollars, eliminating the problem.) In other places, you may get a 5% better rate on the street, but the risk isn't worth it. At borders, where you need to change money on the street to afford a ride to the nearest town, you just change ten bucks' worth of currency from the previous country - preferably without taking out your money stash - and accept that you're going to get an awful rate. In town, you use a semi-trusted source; ask staff or security where you're staying, or people at a cafe, somewhere that caters to travellers. Then the transaction is indoors, in a controlled environment, with plenty of time for everybody to doublecheck, and you know someone to go to if there's a problem. In Victoria Falls, at least, the fuel shortage is not that big a deal. It's close enough to the border, and there's sufficient local liquidity on the currency black market, that you can often buy fuel smuggled in from rich Botswana for the reasonable price of Z$100,000 per litre. (It's for this reason that the Botswana pula is even more desirable than the US dollar.) Elsewhere in the country, though, if fuel is available at all, it is often only available to those with foreign currency. The Zimbabwe fuel shortage means that people go from Harare to their home village to attend their father's funeral, and wind up stranded there for weeks. It means that ambulances have been replaced by oxcarts in certain remote areas. It means that businesses shut down, buses do not run, fields are not tilled, grains are not milled. It means that any driver that does come into the country makes sure they bring enough fuel to get out again. It means that the black market quite literally keeps the country running. If you have some source of hard currency - probably from a relative working in a foreign nation - you're OK. If not, your life is paralyzed. It's not that there isn't any gasoline available for import. It's that hyperinflation, and the government's subsequent attempts to fix both the price of fuel and the value of its currency, has caused legal importers to throw in their hands and give up. There is no way to bring fuel in, sell it legally, and make a profit - in fact, you'd lose more than half your money. And so the country stays in stasis; food shortages worsen, here in what everyone will tell you was once "the breadbasket of Africa", a nation that once exported food to all its neighbours; and slowly, day by day, the country rots. There are a few things you should understand, that may not be obvious if all you know about Zimbabwe is what you read in the media. The first is that this was once a rich country. It didn't just feed itself; it had thriving tobacco, mining, and tourist industries that brought in stacks of money. Villages that the train passed by were dominated by brick houses with tiled roofs, not the bamboo-and-thatch or concrete-and-tin of east Africa. Bulawayo, "the City of Kings", Zimbabwe's second city, in which I sit, is a city of wide boulevards lit by elegant street lights, big beautiful parks full of majestic trees, museums, galleries, theatres, department stores, factories, hypermarkets, metered taxis, cinema multiplexes, golf courses - and once upon a time, not so long ago, these catered not just to white farmers, Asian merchants, and rich government cronies, but to a growing African middle class. The second thing is that while straits are dire here, it is not a place in the midst of utter ruin. The government is fascist, but this is not, for the most part, a violent police state. There is no visible men-with-guns presence. There are no roadblocks, but all African countries have these, and I haven't seen anybody trying for a bribe. Journalists and opposition politicians have been beaten, jailed, tortured, and murdered, yes - but at the same time, there is a very visible political opposition, and while the press carefully watches what it says, it doesn't just parrot government propaganda. Some stores are closed, and others have thinly stocked or half-empty shelves; the streets are half-deserted; there are power cuts, and water cuts, and Bulawayo's water is no longer safe to drink; some people in remote areas are beginning to starve; the papers are full of news of factories that have closed, or agricultural plans that have been abandoned, due to lack of forex but - from what I've seen so far, mind - somehow, life goes on. People cope. It's an economic crisis, not (yet) a security crisis. Don't get me wrong, these are desperate times for Zimbabwe, but the country is not collapsing. Instead it's slowly rotting away. Which may be worse. The third thing is that there is actually room for a kind of guarded optimism. The place may have finally hit economic bottom. Tourists are returning to Vic Falls: three years ago, the Victoria Falls Hotel had nights with fewer than ten guests, but right now, an average of 150 are esconced in its colonial luxury. Two weeks ago, the official dollar rate was US$1=$Z26000, but the pragmatic new central-bank governor has introduced an "auction" system (he's not allowed to say "devaluation" because Mugabe will flip out if he hears the word) which has already raised the rate to a more realistic Z$60000, and is expected to bring it up to the black-market rate in a few weeks. And the government is now permitting small-scale importers to bring in fuel - until a few weeks ago, exclusively the legal right of the ministry of transport, whose officials siphoned away all forex for themselves. There is a chance that in a month or so the Victorial Falls Total station may once again sell fuel. It's not much, but maybe it's a start. What went wrong? That, my friends, is both a simple story, and a long and complex one. Either way, it's a subject for later posts; this one's long enough already.